Another take on the art installation on the Marple & James building on Pleasant Street. 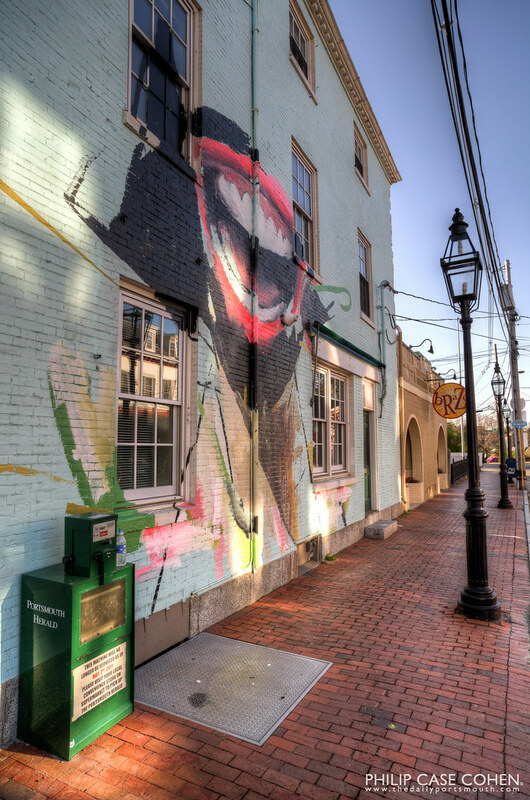 As it turns out, the artwork in the public spaces around town is part of a larger citywide installation of street art that the Portsmouth Museum of Art is curating. I can’t wait to check out the exhibit in the museum once it opens…visit their site at Portsmouth Museum of Art and tell them I sent you. This work was still early in its progress – now complete with painted windows, eyes, a nose, hearts and some words. Stay tuned through the week for more visuals of this awesome project. Shame that some people have been defacing the artwork so recently after its completion. A production trailer in Prescott Park will be featured tomorrow…come back to visit!